April 20, 2016 April 17, 2016 / Elizabeth T.
Can you all believe April is already almost over? I can’t believe how fast the month is going by, and spring is definitely in full bloom, as evident by the bright sunshine, occasional showers and spurts of rain, cool breezes, and warmer weather! Despite the fluctuating weather, I’ve definitely noticed that my wardrobe has been steadily heading into the direction of warmer days, and that’s most evident through my shoe choices. More specifically, I’ve been wearing 4 pairs of shoes on repeat as of lately because these lovely little beauties are perfect for surviving the somewhat bipolar weather that we’ve been having in Los Angeles. Up first are these gorgeous little faux leather, double zip ankle booties. 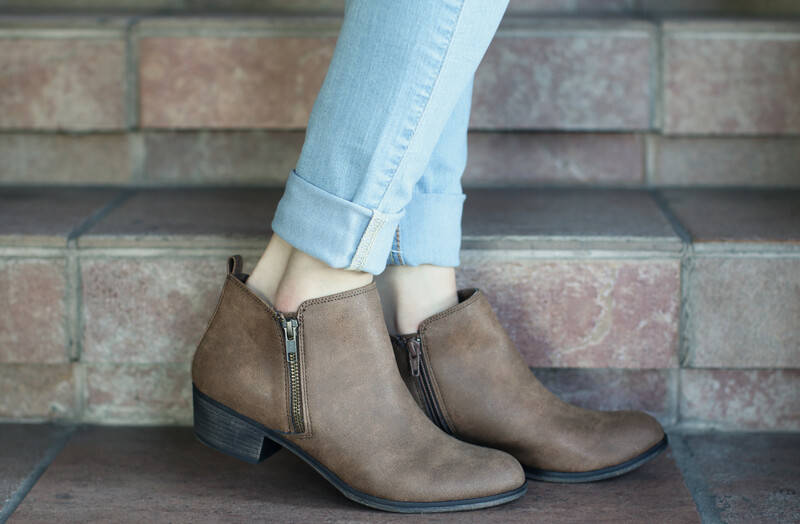 The rustic brown color is so pretty and versatile because it matches with almost everything in my closet, and I like how the little zipper details make it stand out from an ordinary bootie without going too overboard. There’s also a tiny little heel, so it does add just a bit of height to your whole silhouette as well, which is never a bad thing because who doesn’t want longer and leaner legs, right? These booties are no longer on sale, but you can find some similar styles here, here, and here. In addition to these faux leather ankle booties, I’ve also been a huge fan of these light tan suede ankle booties. The suede make these shoes appear delicate despite its sharper toe and higher heels, and I love how sleek they make my feet look. Plus, they also help to streamline the legs so much, so whenever I pair these with skinny jeans, they make me appear a bit taller. Another big bonus – these suede booties are waterproof, making them a great choice for the occasional showers that we’ve been getting in LA! Aside from booties, another pair of shoes that I’ve been wearing on repeat are these shiny tan oxfords! I love how polished, chic, and classic they are, and when paired with a half-tucked dress shirt and skinny jeans, they give off such a timeless look that’s feminine with just the right touch of masculinity. I also love how versatile oxfords are because they can be paired with skirts and even dresses to balance the girly silhouette of these ensembles. While the pair that I have are now sold out, you can find similar ones here, here, and here. 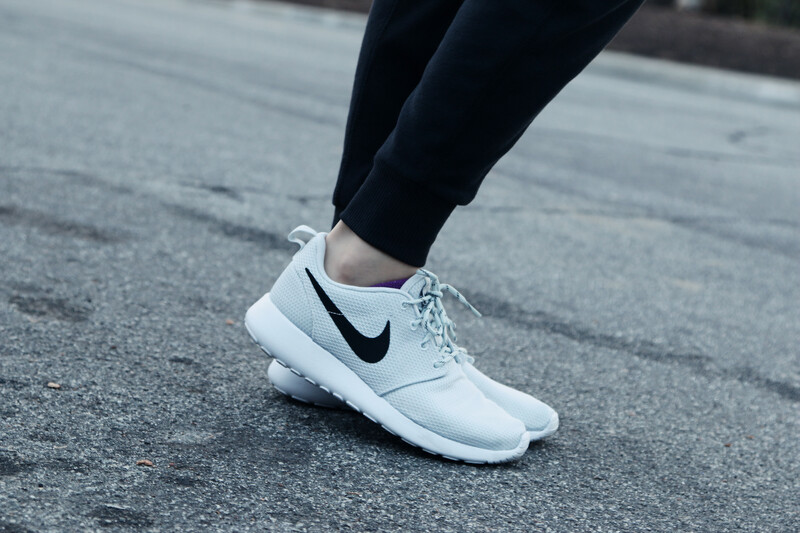 And of course, last but not least, the shoes I’ve been living in are my favorite sneakers – the Nike Roshe Ones! As you all probably already know from my previous OOTD posts (here, here, and here), I’ve been a little obsessed with the athleisure, sporty off-duty look lately. Not only are these outfits very chic, they’re also super comfortable! Although there are so many different sneaker options, I really love the Roshe Ones from Nike because they’re so comfortable and lightweight, and they surprisingly look so stylish paired with joggers and leggings! So these are the 4 pairs of shoes that I can’t get enough of this spring! What’ve you all been wearing on repeat this spring? I’d love to hear what your wardrobe choices have been in the midst of the fluctuating spring weather! Don’t forget to drop by and say hi! Adore each one and lovee the neutral palette. Love them all! Super chic and comfy! The oxfords and the booties are essential! The two last ones are soo dope! Love both! Those really are shoes you need to have in your closet! The Nike’s are simple yet have some sort of alluring appeal. Love all of these shoes, especially those Nike’s! Yes, those Nike’s have been my faves too ❤ 🙂 Thank you so much for stopping by love! Thank you so much Filipa ❤ 🙂 I think they're sold out of this color now 😦 But the white ones are pretty cute too! They are simple, yet, interesting. Lovely shoes! 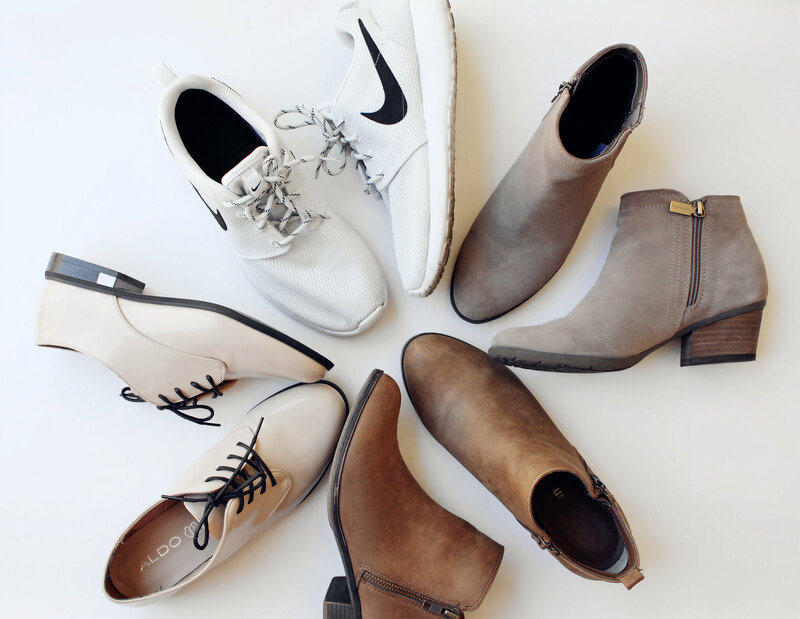 My favorite two are the rustic brown booties and Nike Roshe sneakers. Thank you so much Shirlyn ❤ I've been practically living in my Nike's these days 🙂 They're so comfy! Those stand out very much. i love the faux leather booties! Though I am super excited that summer is right around the corner, i’m gonna miss wearing my boots haha. Love all these shoes Elizabeth, and Nike sneakers looks really comfy. 🙂 have a great day! Thank you so much Tiffany ❤ Haha I've been wearing those faux leather booties nonstop too! And me too – the warmer weather will definitely be nice, but I'm going to miss wearing boots so much 😛 Hope you're having a great weekend too, Tiffany! Love the shoes, especially the ankle boots! Yes, that’s been my favorite this past month! 🙂 I’ve been literally wearing it nonstop ❤ And they're super comfortable too!